"What would we really like to see if we could stand outside ourselves and look at us?" It's hard not to think about the 2004 movie The Machinist when watching last year's indie darling Another Earth. With plots heavily resting on guilt and solitude, the two films would make an interesting--albeit depressing--double feature. But Another Earth has a little quirk--it's a dramatic film fighting with its sci-fi alter ego. Brit Marling stars as 16-year-old Rhoda Williams, a smart, ambitious young woman who, after a night of celebrating her college acceptance, gets behind the wheel of her car and accidentally crashes into and kills a mother and her child. That same night she learns that a duplicate planet has been discovered in the solar system. Both events have a profound impact on her life in the years that follow. Several years later, Rhoda is released from jail and wrought with guilt over what she had done. She returns home to her parents and brother and lapses into a very solitary state of existence, working as a building janitor. Her life begins to float alongside everyone else's without having any real contact, just as this doppelganger planet shadows Earth. That is, until the day she decides to ever so softly slip back into the life of John Burroughs (William Mapother), the man whose wife and child she killed years earlier. As the audience trudges through the hollowness that has become Rhoda's life, the movie is narrated by somber breaking news headlines about the other planet, which tends to interrupt the flow of the movie in a slightly Tree of Life kind of way (but thankfully not as elaborately). Sometimes Rhoda and her family are shown watching TV reports about it, but other times Rhoda is just walking on the side of the road or staring into nothingness. The movie is rather slow, so these scenes take a particular toll on the audience. As the movie progresses, we see the duplicate planet flirting with Earth, a phenomenon by which Rhoda becomes more and more enraptured. But the second half of the movie, where it focuses more on Rhoda and John, is more streamlined and far more remarkable. The relationship between them is as elegant as it is frightening since the audience knows the truth behind it. We are able to empathize with Rhoda, but fear for her as she struggles to find her way back to herself. Even with its faults, Another Earth is quite an achievement from 28-year-old Marling, who also co-wrote the screenplay along with director Mike Cahill. Marling illuminates Rhoda in a way not many young actresses could, in such an honest portrayal of sorrow and existentialism. Mapother is touching as the grieving dad whose spirit is finally reawakened after a chance encounter with an unknown soul. 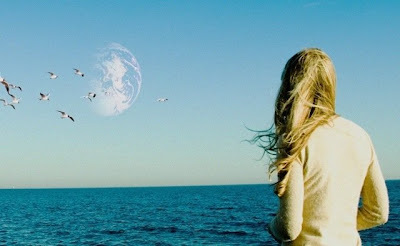 Another Earth is quite a gem in a lot of ways, but wrapped in an enigma. It's a very sophisticated approach to a familiar theme. Great write-up! And nice choice on the title of the piece. This movie stuck with me. It touches the boundaries of grief and then elevates its characters towards redemption. Lovely film.